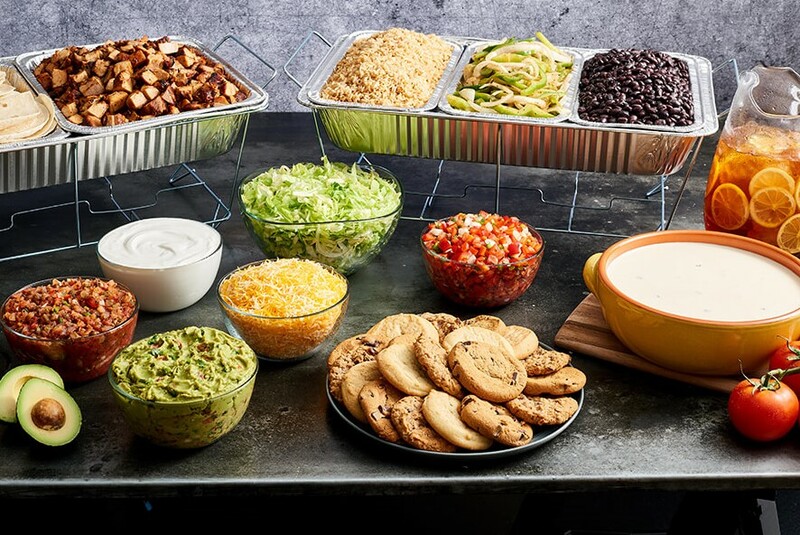 Our most popular catering menu item is the fajita bar, which contains soft flour tortillas, choice of protein,pinto or black beans, rice, mixed onions and peppers, shredded cheese, lettuce, sour cream, guacamole, pico de gallo and chips and salsa. It’s the souped-up version of the taco bar. Not only are the portions bigger, but the fajita bar also includes those extra fresh ingredients. The grass is greener on this side with our salad bar. Sporting lettuce, choice of protein*, pinto or black beans, shredded cheese and pico de gallo. And unlike the others, this healthier option comes with cucumbers, olives and our homemade dressings: chipotle ranch, southwest vinaigrette and fat-free salsa vinaigrette.